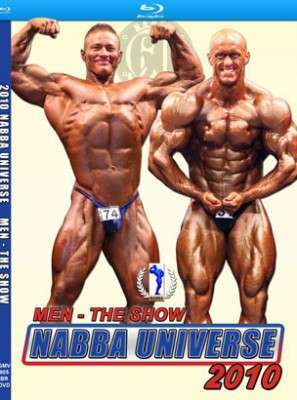 The 2010 NABBA Universe: Men – Prejudging and Show provides a close-up look at some of the best amateur and professional competitors in the world. You will see the posing routines of all amateur competitors in all classes, plus the posing routines of all Professional Mr. Universe competitors. Held in Southport, England on October 30th, the 2010 NABBA Universe celebrated the 60 Years of NABBA. This is our FIRST EVER HD RELEASE ON BLU-RAY. Shot in HDV 1080i (1440 x 1080 interlaced). The 2010 Men’s Prejudging provides an in-depth look at some of the best amateur and professional competitors in the world. DISC #2 – Men: Show. The 2010 Men – The Show provides a close-up look at the best of the best amateur and professional finalists at the 2010 NABBA Universe. You will see the posing routines of all top 6 amateur competitors in all classes, plus the posing routines of all Professional Mr. Universe competitors. Please email wayne@gmv.com.au if you wish to have a custom made PHOTO DVD prepared on any specific bodybuilder or class from this event. Photos by Rob Szabo. 3 Petr Vanis – Czech Rep.